Nkwali Lodge is located on Robin’s private land, overlooking the National Park. The land is superb game viewing country, with a beautiful area of ebony woodland and open grasslands. 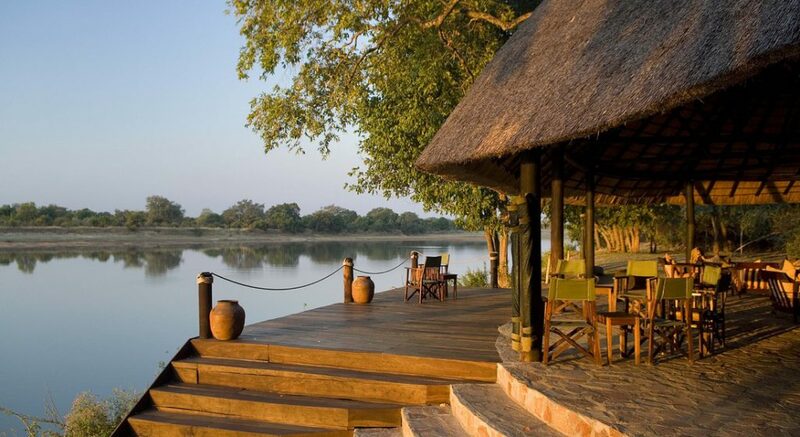 Elephants regularly cross the Luangwa, seen from the bar, or come to the waterhole near the thatched dining room. Nkwali accommodates a maximum of twelve guests in six cool and spacious A-frame chalets, constructed of woven bamboo and thatch. Each chalet has its own enormous open-air en-suite bathroom constructed primarily of moulded clay. Thick cotton towels and an assortment of Imperial Leather and Crabtree & Evelyn toiletries are a luxurious touch. The common areas are also breezy and capacious. The bar is creatively built around an enormous ebony tree and the separate dining area overlooks a small lagoon which often attracts elephants and bushbuck to drink. The chalets are cool and spacious, overlooking the river. Access to the park is by boat or our nearby pontoon. The area is famous for leopard and giraffe sightings. 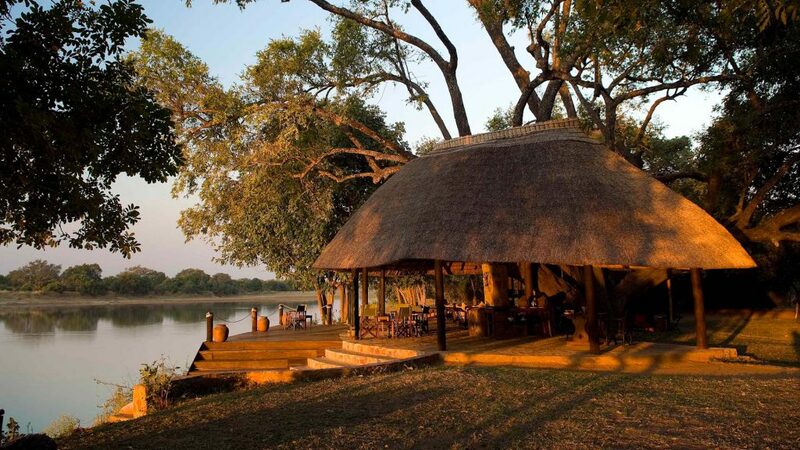 Built on the banks of the Luangwa River, Nkwali Camp sits under the shade of tall mahogany, ebony and sausage trees. Owned and run by Robin Pope Safaris the camp is well situated a relatively short drive from Mfuwe Airport and overlooking South Luangwa National Park. 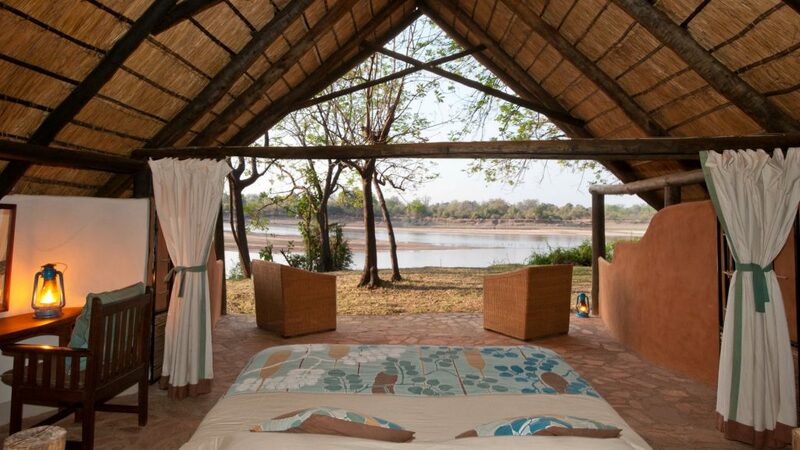 Nkwali Camp has six stone-and-thatch chalets, each overlooking the Luangwa River and the park beyond. High ceilings and flagstone floors help to keep these spacious rooms cool in the summer and warm during winter . The chalets are completely open-fronted allowing guests to lie back on their comfortable beds whilst watching animals visit the river to drink. At night, large mosquito nets are lowered to cover the beds, whilst bamboo and metal shutters are drawn across the front of the room to keep out unwanted visitors. Each chalet has a large en-suite bathroom with twin sinks, flush toilet and an open-air double shower. - The central bar area is built around a very old and huge ebony tree. 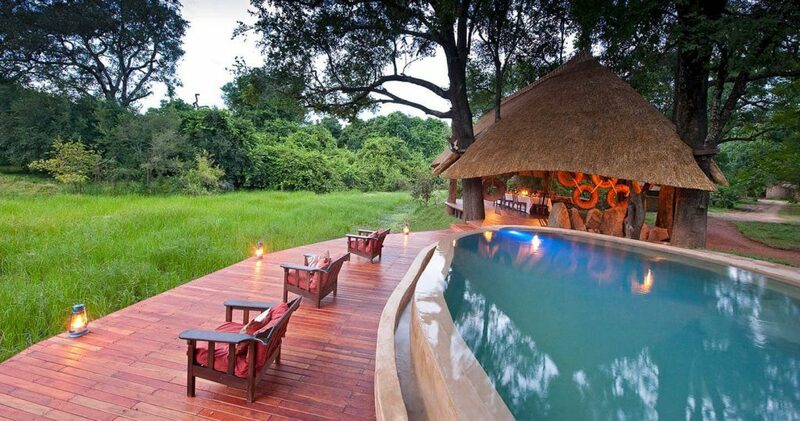 - Many animals, including elephants, drink at the small lagoon by the dining platform. - The wonderful fresh salads and vegetables come from the vegetable garden at Nkwali. - Access to the park is by boat or pontoon. Not really. It depends on you. If you want, ABC trekking can be done independently. You could hire a guide and a porter by yourself instead of going through an agency or not hire a guide at all. Although, not having a guide can be a little problematic during off season. It really depends on you. Is it your first time in Nepal? How confident are you of being able to find your way around? How pressed on time are you? If you go through an agency, it will be costlier but everything will be planned. You will only have to come, trek and return.